UNITED NATIONS -- The most senior United Nations diplomat to travel to North Korea in at least five years warned North Korean leader Kim Jong Un that "time is of the essence" to come to a solution, the U.N. said Saturday. The diplomat returned to New York from Pyongyang on Saturday after meeting with high-level representatives of Kim Jong Un. U.N. Undersecretary-General for Political Affairs Jeffrey Feltman emphasized "the urgent need to prevent miscalculations and open channels to reduce the risks of conflict," the U.N. said. 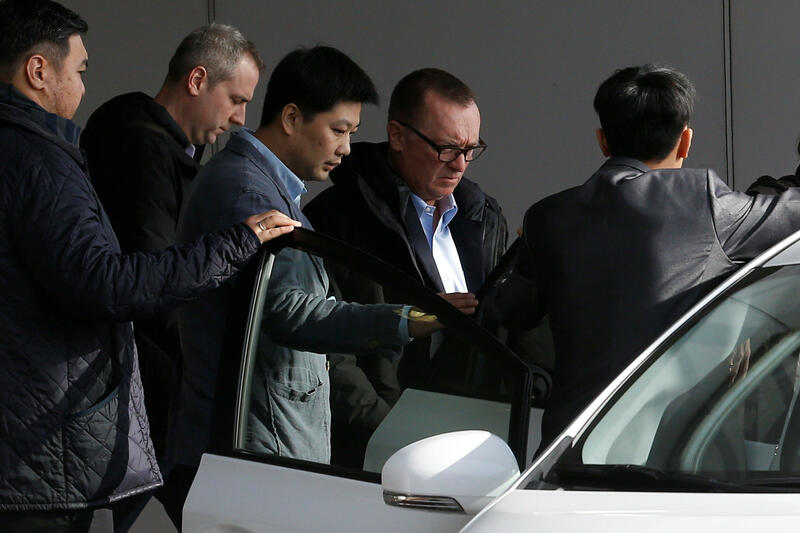 Feltman, who is a former President George W. Bush appointee, traveled to North Korea from Dec. 5-8 for talks with representatives of Kim Jong Un, as threats of escalation rise in the Korean Peninsula. The U.S. State Department has made clear that Feltman represents the U.N., not the U.S., in diplomatic overtures. North Korea said it has agreed to regular communication with the U.N. The country announced last month that it had successfully tested a new type of intercontinental ballistic missile (ICBM), which it claimed is capable of reaching the United States. Feltman's trip comes at a time when the U.N. Security Council is deadlocked on further sanctions and as backchannel talks between the U.S. and North Korea have not been fruitful in terms of official negotiations on denuclearization. In North Korea, Feltman met with Pyongyang's Minister of Foreign Affairs RI Yong Ho, and Vice Minister of Foreign Affairs, PAK Myong Guk. The U.N. diplomat said that "the international community, alarmed by escalating tensions, is committed to the achievement of a peaceful solution to the situation on the Korean Peninsula." Feltman, who was accompanied by several U.N. diplomats, met with the United Nations Country Team and visited U.N. project sites. During the site visits he "learned about the U.N.'s life-saving work on the ground as well as the challenges in procurement and funding gaps." U.N. Department of Political Affairs' José Luis Díaz, a member of the Strategic Communications and Public Affairs division who often serves as the spokesperson for Feltman, told CBS News that Feltman will brief the U.N. Security Council on Tuesday, behind closed doors, and then speak to reporters. That briefing will be followed on Friday by a minister-level open Security Council meeting on North Korea (called the Democratic People's Republic of North Korea, or DPRK) that was called by Japan, as the Council President for the month of December. The attendees at that meeting are still being formulated, but Japan's Mission said that they are expecting U.S. Secretary of State Rex Tillerson and Japan's Foreign Minister, Taro Kono. Japan's U.N. Ambassador Koro Bessho told CBS News that he will be leaving for Tokyo on Monday evening to join the Secretary General, Antonio Guterres, who will be meeting with Japan's Prime Minister Shinzo Abe - the first visit for the Secretary General since taking office. Bessho said that the topic of North Korea will "certainly be discussed a lot." South Korean Ambassador to the United Nations Cho Tae-yul believes that the Feltman trip for the U.N. is "part of its so-called preventative diplomacy." Meanwhile, KCNA, the official news agency of North Korea released a statement on the Feltman trip with slightly different contours. At the project sites of U.N. organizations and hospitals, KCNA said, "Under-Secretary-General became aware that sanctions are having negative impact on the field of humanitarian cooperation and expressed his intention to put in efforts to ensure that the cooperation is carried out in accordance with its humanitarian mission." "The DPRK side and the UN Secretariat side acknowledged that Under-Secretary-General's visit to the DPRK contributed to promoting trust between the two sides and agreed to have regular exchanges of opinions through frequent exchanges of visits at various levels," KCNA said. Regardless of the agreements expressed by North Korea on the U.N. diplomats' trip, the North Korea statement said that the current tense situation on the Korean peninsula is "completely due to the U.S. hostile policy and nuclear threats against the DPRK and that even at the very moment of their talks, the U.S. is revealing its intention of launching a surprise nuclear preemptive strike on the DPRK by conducting the largest scale ever joint aerial drill mobilizing different kinds of nuclear strategic bombers." On the humanitarian issues, the U.N. has several agencies operating in North Korea. Steve Taravella, senior spokesman of the U.N. World Food Programme, now headed by former South Carolina governor David Beasley, told CBS News that the WFP is working through disaster risk reduction measures, "to build more resilient communities, since DPRK is vulnerable to natural disasters, such as droughts and floods that affect agricultural production and damage lives and livelihoods every year...We aim to reach 650,000 people each month with food assistance." For context, he explained that about 10.3 million of the country's 24.8 million population is food insecure. Richard Gowan, a U.N. expert at the European Council on Foreign Relations thinks Feltman is making the point to be diplomatic and open doors for the U.N. and to caution North Korea about the increase in rhetoric. He told CBS News: "It looks like the U.N. is trying to be fair with both Pyongyang and Washington, emphasizing the need for DPRK to obey Security Council resolutions, while also hinting at international concerns that the Trump administration is escalating the conflict and risks "miscalculations" with its warlike rhetoric." In Washington, the value of diplomatic talks is contested. Tillerson and Trump have sparred on the issue of whether talks are useful, although meetings continue, and Joseph Yun, the U.S. envoy for North Korea, met with Pyongyang's representative Pak Song-il, a senior North Korean diplomat at the country's U.N. mission. At the U.N., after the latest ballistic missile launch, U.S. Ambassador Nikki Haley told the Council, "The dictator of North Korea made a choice yesterday that brings the world closer to war, not farther from it." "We have never sought war with North Korea, and still today we do not seek it," Haley said. "If war does come, it will be because of continued acts of aggression like we witnessed yesterday. And if war comes, make no mistake, the North Korean regime will be utterly destroyed." The U.S. is also co-hosting a U.N. side event next week on the issue of human rights in North Korea. On Dec. 11, the Missions of the United States, Australia, Canada, France, Japan, the Republic of Korea, and the United Kingdom will jointly host "North Korea Human Rights: The Terrifying Experiences of Forcibly Repatriated North Korean Women." Before Feltman left for Pyongyang, he told the Security Council that he met with North Korea's Ambassador Ja Song Nam to tell him to cease taking destabilizing steps. "Desist from taking any further destabilizing steps," he said, adding that this "is the 13th time the Council has met to discuss North Korea." Feltman said that he told the North Koreans, "there can only be a diplomatic solution to the situation, achieved through a process of sincere dialogue" and they "agreed that the current situation was the most tense and dangerous peace and security issue in the world today."